We invite you to call this special place your home. : a blessing that is regarded in various Eastern religions as an indwelling spiritual force and divine gift inhering in saints, charismatic leaders, and natural objects. Become immersed in a creative and inspiring space that will touch your soul. Emblematic of Antigua's historic style & Betraying of world travel influences. Why come to Baraka Antigua? A getaway from Antigua's charming buzz. Looking for serenity whilst maintaining easy access to the colonial city? Baraka Antigua is minutes away. Jardines de Antigua is our neighborhood - peaceful, beautiful, safe. Choose from numerous intimate spaces to occupy - both indoors and outdoors with over a dozen shared spaces: informal kitchen gathering space, panoramic rooftop terrace, fireside lounge sofas, formal dining table, library reading corner, yoga&meditation room, relaxing front porch rocking chairs, garden coffee table corners, traditional Guatemalan sauna, garden dining room, outdoor lounge & sweetheart coffee table. - Garden: aesthetic, colorful, tropical, fish pond, plants, mural, green bamboo wall, jasmine. - Yoga&Meditation room: symbolism, colors, chakras, energy, 5 elements, peacefulness, light & darkness, candles & incense. - Library corner: inspiring, fiction, healing, reality, beauty, humanity, living, serenity. - Moroccan lounge: travel, exotic, romanticism, music, informal connections, bohemian, evenings in good company, escape to another world. - Front porch rocking chairs: candles, garden views, sheltered, outside, glass of wine, conversations, scents of the night, read a book. - Kitchen: heart of the house, social hub, home grown organic coffee, cook at home. Each room is unique. All rooms are calm and comfortable, most with en-suite facilities. On our Rooftop Terrace: watch erupting volcanoes from the best vantage point! Savour mesmerizing scenery over your breakfast while sitting with your morning coffee soaking in the view of the volcanoes and dissipating mists as the sun rises above the hills. - tropical bees: reassuringly they are stingless! They are much smaller than regular bees, often mistaken for funny flies. See if you can find the different beehives and let use know! - our garden cat: Indie! She talks a lot and is rather social. She lives outside, but will come inside if invited. Nowadays with our often complicated lives, luxury lies in simplicity. More than a building - where the sum of the parts deliver so much more! Nourish yourself from the wholeness of the spaces here. Please visit our other magical rentals on Lake Atitlán. We also offer retreat hosting facilities on Lake Atitlán: teachers/facilitators please inquire. All parts of house. Some cupboard spaces have been locked with owners private belongings. The neighborhood is Antigua-like (cobbled stone street) yet 1.5 miles out of town center (less than 1 mile from the edge of town). It is very quiet around here - hearing countryside like night critters, roosters, different owls sometimes. No main road pass within hearing distance. I offer use of a vehicle. You can also walk to/from town (25mins) or take a tuktuk back (a few minutes). Journeying with creating experiences, this theme energizes the creativity that nourishes the making of the endeavors I take part in. I spend approximately half the year in Guatemala (part in this property in Antigua, part in San Marcos La Laguna on Lake Atitlán). The rest of my time is dedicated to spending time with my daughter who lives in Europe, visiting family/friends and, taking part in AcroYoga encounters and workshops around the world. So close to town (Antigua) yet a world away! It is important for me to live in a space and neighborhood that is quiet and peaceful with access to trees, plants, natural beauty. This house is situated in a neighborhood that is already built, which will and has not yielded any architectural surprises. The vast majority of houses are of great taste and pleasing to see. The view of rooftops is mostly tile and spires, when seen from our rooftop terrace. Over the ten years of owning this property, I have given it textures, colors and features that makes every space a feeling it has reached its full potential. All spaces feel comfortable - granted improvements can always happen! Ample bathrooms allow for house guests to feel the privacy of their rooms - most benefiting from en-suite bathrooms. Recently added is a garden cold shower for use with sauna sessions - a very welcome and refreshing splash to cool off from hot sauna sessions. The house is strictly a smoke-free environment. Smoking permitted in the garden. There are so many interesting features and spaces in this beautiful house. It feels secluded, but it is very easy to get into Antigua. Nancy was very helpful when we checked in. She expained how things work in the house and made sure we had what we needed. The view from the rooftop deck was great when the weather was clear. ann p.I will be traveling to Guatemala from Guadalajara Mexico . Property sooo comfortable. I wanted more time alone quietly enjoying every nook. And I wanted more time with my fiance enjoying the bath tub and the temazcal as well as the local activities. The procession the 5th sunday of lent was impressive. JB was a wonderful help and made sure we were comfortable. The jeep was great for getting around in the town. I hope we can visit again. We were a party of six with two couples and two singles. We used four of the five bedrooms in Greg’s house. Each one of our rooms had its own bathroom for personal privacy. The master bathroom was as modern as I have seen anywhere. The whole house deserves to be in a house beautiful magazine. The attention to details makes this house feel like your home. Greg has decorated it tastefully with the details of his life. There are several gathering areas for socializing. The roof deck is challenging to get up to but it is well worth it for the views and ambiance. The house is surrounded by beautiful, well-kept gardens (both visual beauty and you can eat some of the growing herbs). The whole compound is surrounded by high walls to keep you feeling very safe and with ultimate privacy. The kitchen is well stocked and a crowd gathered when any meal was cooking. The neighborhood was very quiet but close enough to walk to dine or find entertainment. The house manager, JB, was always available, for a fee, to provide transportation and a personal guide to the major attractions around Antigua. He speaks excellent English. He also runs a shuttle business that will provide transportation to and from the airport. I highly recommend Greg’s house and JB’s services. If you have a group like ours, it is the perfect place to stay. Upon arriving to the home I could not believe how mesmerizing the house looked. Pictures give it no justice when it comes to the nature surrounding the home and how wonderfully decorated the house is. You must use the entertainment/projector room; Greg has a huge selection of DVD's to choose from. The fully equipped kitchen is absolutely stunning with beautiful window views of foliage and we even had some friendly bees collecting nectar outside the window. The master bedroom was perfect for us and the energy in the entire home was very welcoming. From the Terrace you are able to see all 4 volcanoes (Agua, what the locals call Gemelos because there are two side by side, and Fuego) and the Fuego volcano, which means fire, was erupting during our entire stay! Take binoculars to get a closer look. The only downside to the home are the mosquitoes that live in the cute little pond outside (which needs to be cleaned). We were getting bit every night, so try not to leave any windows open after sunset. Also, JB the keeper was nice but a bit pushy about hiring him to take us on tours but we had already booked with other companies. Nancy the house maid was very friendly and kept the house extremely clean during our entire stay and kept to herself to allow us to have our own space. Other than the annoying mosquitoes, we had a wonderful time enjoying the house. If I could give this home more than 5 stars I would! If you love nature, waking up to birds chirping, stunning views, peaceful surroundings, and a safe neighborhood, this house is perfect for you! Our family of six adults stayed over Christmas 2015 at this beautiful home! What a wonderful week! The rooms were uniquely decorated and all had the amenities we needed to feel at home. JB picked us up at the airport and expertly transported us to Antigua safely while pleasantly giving us tips about the house and the area. Having the maid come by mid way into our week was also a special treat! Our favorite spot was the rooftop deck, where we watched Del Fuego erupt on clear nights plus watched the Christmas fireworks displays that were going on throughout the town and as far away as the valley of Agua volcano. Second favorite was the video room, where we would gather for afternoon movie-nap! After a great day of shopping or sightseeing, it was nice to have a room for everyone to lay comfortably and either enjoy a good movie or sleep. Then we’d head out again to town. Speaking of heading out, the use of the jeep was so very convenient and helpful! It was a terrific addition to the amenities offered with the house, thank you so very much! The jeep has a parking pass, so that also was a great time/money-saver. Hints: Love coffee? Head out early in the morning to the downtown square and eat at one of the two cafés on the square. Our favorite was Café Condesa – excellent coffee, breakfast and lunches! The town is just waking up and the solitude juxtaposes the hustle and bustle at other times of the day. There’s a hidden gem of a market next door – you’ll find great prices and great shopping – go on in! We enjoyed the tour to walk up to the top of Pacaya Volcano. Bring 100 Quezales to ride a horse unless you are fit enough to walk up-hill for an hour. There are also coffee tours, which are interesting and fun, plus a coffee farm nearby the house! Restaurants we liked were: Sky Café, Frieda’s, Café Condesa, Fusion. Suggestion for the owner: Label the light switches. It was difficult to remember which light switch turned on or off lights. We liked the idea that many lights were on sensors, but when you don’t know which switch to use, it’s more complicated. Such a lovely house. It's just outside the city center but the car provided allows to go to town in a few minutes. We never had any issues finding a place to park. It is in a safe neighborhood, not as quiet as expected but very good overall. The property manager JB was a great help, came to pick us up at the airport (and back), took us to the Pacaya volcano and Lake Atitlan, it was nice talking to him and learning more about the country. You can not beat the views from the roof top! We were lucky enough that Fuego was erupting when we were there, what a night show!! Antigua is an awesome place! 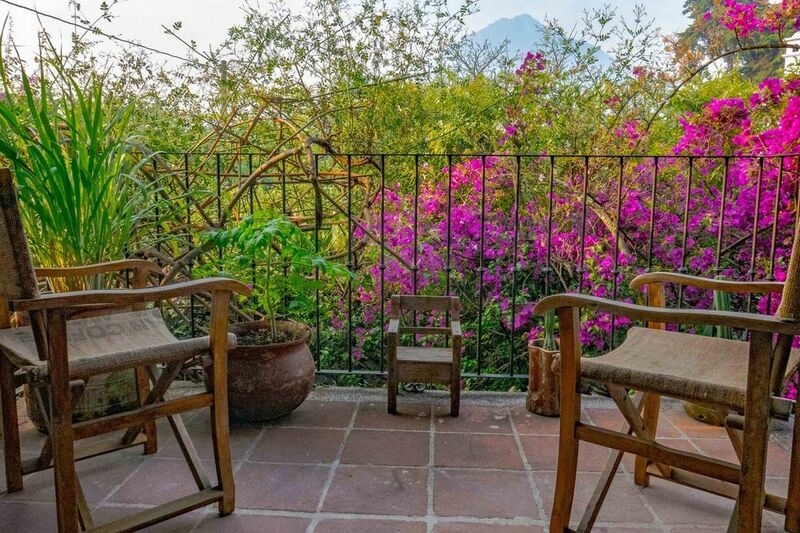 The house is located within minutes of the colonial city of Antigua Guatemala. Surrounded by breathtaking views of volcanoes, hillsides and coffee 'fincas' (farms), you will find yourself in a serene neighborhood. Antigua is located in the Guatemalan highlands that form part of the Sierra Madre mountain range. Beautiful lake Atitlan is only 2.5 hours drive away. If you fancied a getaway to the ocean it stands barely 1 hour away (puerto San Jose) or 2.5 hours to Salvador beaches or Monterrico. This truely is a perfect 'base' for exploring Guatemala, and a starting point for traveling in Central America. Golf: The Santa Maria Country Club is a nearby 9 hole golf course on the slopes of Agua Volcano. Breathtaking views. Makes for a fun time out in the Guatemalan countryside. Caddies and golf clubs available at the club.